Blended learning requires the learner to learn at least in part through online delivery of content and instruction: This digitisation of content and instructions allow learners to gain partial control over place, pace, path and time of learning. The remaining portion of content and instructions must be regularly “taught” in a brick and mortar location with the co-presence of the teacher and student (or learner). The first of these features allows the learning experience to transcend the walls of the classrooms or the “school day” schedule, or the standard pedagogy as well as the rat race to keep up with the classmates. However the second of these features brings the student right back to the coordinates of brick and mortar. The contradiction surfaces because we often look over the teachers and education technology as being mutually exclusive. Everyday newer education technology is emerging with trends like MOOCs and online learning from websites such as Khan Academy taking over the mainstream classroom teaching. And then there are futuristic predictions that technology will replace teachers. However, those who know the correcting formula to Blended Learning also know that it begins and ends with a skilled teacher. While for most, it is hard to actually pin down forth where the online and technology is taking over the literal significance of face-to-face or bricks and mortar. There various permutations of information and interaction in the classroom context of physical co‐presence together with various forms of technical (generally online and digital) mediation which are all being enveloped by Blended Learning technology. 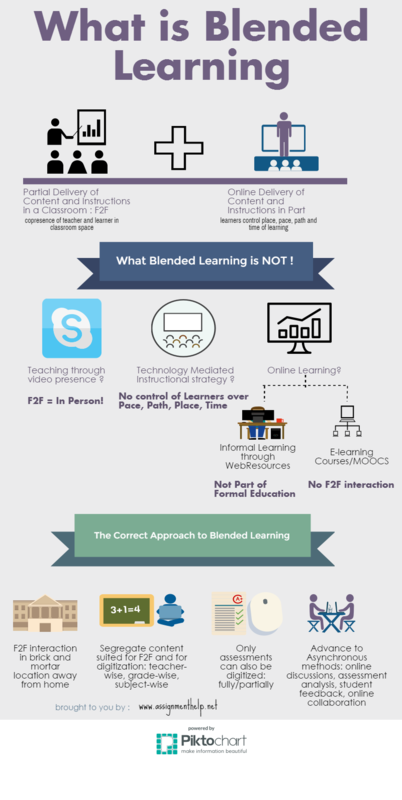 Then what is the correct Blended Learning Approach? What is technology rich instruction or technology mediated instructional strategy? Technology-rich instruction refers to the augmentation of traditional instruction practices with digital tools such as electronic whiteboards, broad access to Internet devices, document cameras, digital textbooks, online lesson plans and Internet tools such as Google Docs or Evernote. Is technology rich instruction a Blended learning system? No! Even though technology rich instructions employ digital tools, online lessons and internet tools, the internet does not actually deliver the content and instructions, and neither do the learners have any control over time, place, path or pace of learning. The internet tools here are simply being functionally used for accomplishing a task and not for content/instructions deliver-ability. Are online learning courses and blended learning different? There are various elearning courses which can easily camouflage as Blended learning systems. For example a student can learn from their own technology device by watching online lectures and online videos or can enroll in an online learning course or MOOCs where both the content and information is being delivered over the internet. However, in the first stance, the instructions and content are not a part of the formal classroom educational framework. In the second example, there is no F2F interaction in a brick and mortar classroom location away from home. The partially online partially traditional format of instructions plays to the strengths of both the extremes. There is no replacement for traditional face to face contact between the teachers and students since F2F interactions offer tacit benefits such as building social relationships, trusts, mentoring and motivational activities by teachers as well as tapping the visual cues to gain more personalised understanding about the learner’s skills, experience, existing knowledge and level of understanding. This allows teachers to receive an on the spot feedback with which they can tune their lecturing content, techniques, gesture, modulations, pace etc. in real time. So in order to create a blended learning system, should teachers digitise all their content and instructions and simply present them in the classroom? For a successful blended learning experience, it is paramount to identify what to blend and at which level to blend. Teachers need to segregate the content which is already being taught well in a traditional F2F format based on lecture style, and what can be improvised upon by digitisation. By making the instructions and content digital, it does not mean that there is no place for lecturing/oral communications/ direct instructions in a classroom. The deliverable suited for these two delivery modes would differ teacher-wise, subject-wise, as well as grade-wise. Also instead of digitising the study content, teacher can initiate a blended learning system by making some/all assessments online. Often teachers can set up for asynchronous interactions with online discussion threads, content handouts, feedback and sending out assessment analysis. Gradually, the teachers can move towards more sophisticated synchronous interactions with real time Q&As and collaborative projects. It is important to start with the ones that are easier to manage and then make it more sophisticated step-wise, rather than a full frontal unsuccessful transition. We hope that these five questions on blended learning will make the distinction between blended learning and online learning very clear and will bring in focus the importance of skilled teachers who use technology in their classrooms. We hope that keeping these five answers in mind will help all teachers, instructors and educators in perfecting the art of BLENDING learning and gather the best of both traditional and online learning systems. Are you blending your classroom? Share your experience with us in comments.